The rejigged batteries and the new cells are behaving themselves, I occasionally manually balance the cells using a couple of neat wiring additions I have made. The first is a plug in tab that allows a 6 cell voltmeter to be attached to each 6 pack of cells, showing the state of charge of each cell, as well as the pack of 6. 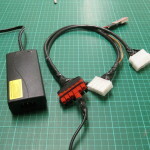 The second device is a single cell charging harness, which uses the BMS wiring to each cell to allow me to plug in a single cell battery charger to any individual cell. 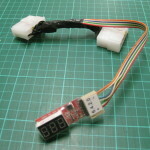 It uses a group of Anderson Connectors to ensure that the charger is only ever connected to a single cell, correctly. 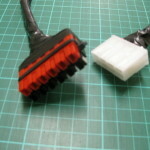 The white connectors are 8 pin automotive connectors which are placed between the battery harnesses and the BMS, which are connected with the same connectors. 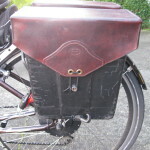 As things are finally settling down on the battery side of things, I have also got on with making the tops for the panniers. 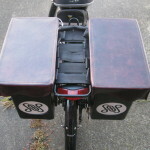 Here are photos of the tops I made for my bike. These are made out of a waterproof polyester fabric called CoreTex. They are double skinned, with a sheet of PVC foam board in the top to give some structure. 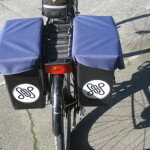 They are secured closed with a loop of shock cord attached through a loop of webbing on the back of the flap. 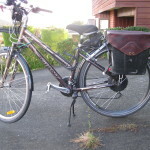 The panniers are also secured to the bike with webbing and shock cord, the shock cord also retaining the batteries inside the panniers. All very neat and tidy, and easy to maintain when necessary. 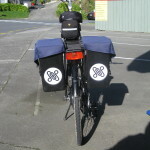 For Lynn’s bike, we splashed out on some custom leather lids, made to my design by local saddler Tim Abbot. They are stunning, double layered on the top and the closure tab, beautifully stitched, by hand in some places, stained to a traditional saddle brown to match the brown of Lynn’s bike, and buffed to a high polish at the moment. Not cheap, but incredibly good value. While they are completely waterproof, we may make some pull over nylon covers to keep them dry in the bad weather! 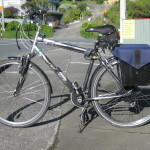 They also close with shock cord, through two eyelets in the flap, and the panniers are attached by shock cord and webbing, the same as mine. 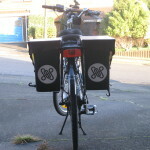 The battery and BMS system inside is identical to mine, so everything is interchangeable. We still have some work to do finding the perfect bike rack for Lynn’s set up, her little legs, and the 700C wheels make some things hard to fit!